Many people are eagerly seeking for some contemporary Elder to entrust to them the solution of their problems. They want to meet a new Elder Paisios, who will have general and boundless love, wisdom from above, a holy life and God-entrusted prayer, through which he will work miracles. 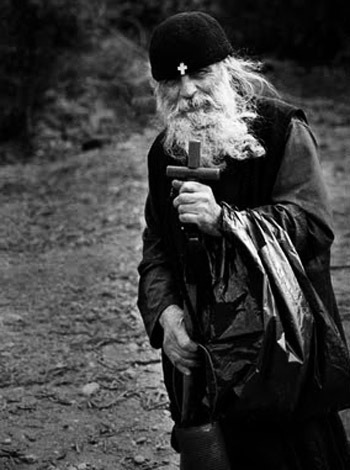 They telephone known clerics to learn about them, and they sorrow because they did not have the chance to meet Elder Paisios while he was alive. The answers they usually receive is that God will send once again such virtuous Elders to uphold us. Obviously this creates hope, but our brothers and sisters want to deal with their problems now and not in the future. One can see this in the tone of their voice, in their pain and in their tears. Many times people rely on others to pray for them, forgetting that their own prayers, when it comes from a pure heart, are heard and requests are satisfied. Communication with God should not be done through a third party. Everyone must pray, struggle spiritually, observe the commandments of the Gospel, and communicate with those who can help them. Alas, if a hurt brother or sister becomes idle and slothful! They should become active and find the path of God. I notice that many study the various books which are written about contemporary Elders, and they remain more on the miraculous events and less on their teachings. This is something that must be corrected. The aim of a miracle is so that the Elder can become known and to certify his sanctity. The number of miracles has no particular value. What is one, what is a hundred? They are the same. We must not forget that it is Christ who works the miracles through the virtuous man. If Christ judges that one miracle requested by an individual will not be of help spiritually, then He will not do it. Our attention should be directed mainly to the lessons and teachings of the Elders. We have to study and contemplate them, be fascinated by their meaning and strive to implement them without reservations and misinterpretations, always confident that everything taught by the Elders they had previously applied to themselves. Their teachings are experiential, this is why it alters in a sacred way the well-intentioned students who receive the spiritual seeds in the field of their souls and advance in the life in Christ. Soon we will discover that the path of the Elders must become our own path and their experiences must become our own experiences. It is not enough to be fans of the Elders and in our lives to follow a different path. We must also be their humble imitators. Let them be shining examples in our spiritual life.